One of the most important keepers of Aboriginal law and culture among the Gija people, Timmy Timms came to painting very late in life, in the year 2000. He died having only created a handful of dramatic canvases that stand as a remarkable testament to his deep knowledge of and feeling for his culture and his country. 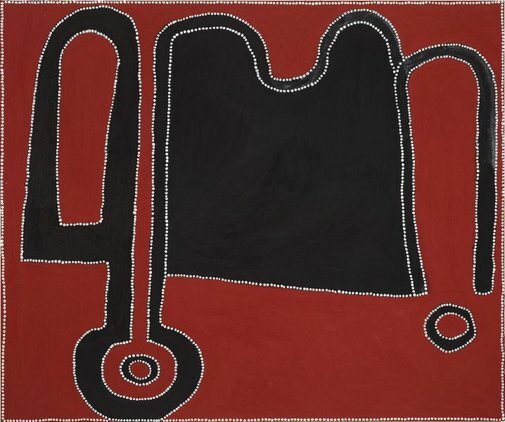 In his art, as in his life, Timms's primary goal was to pass on to the younger generation his extensive knowledge of the Ngarrangkarni, ceremonies and history of his country. He was also an accomplished singer and dancer of several important forms of joonba (song and dance performances). However, in one of his most dramatic works, 'Bedford Downs massacre', 2000, Timms does not portray the ancient stories of the Gija, but focuses on an incident from the violent early days of contact between the Aboriginal peoples of the East Kimberley and white settlers. With its spare, sinuous lines and large areas of ochre, the canvas reveals the site where a group of Gija people were massacred, sometime around 1924. The men had been convicted by a local court of killing a bullock on Bedford Downs Station, and were sent back to the station with 'tickets' hung around their necks as a sign to the station owner that they were guilty. Some of the men discarded these tickets before they got back, but others chose to keep them. On their return, those who still had their tickets were taken to a remote location and told to chop wood. After a morning's work, the men were given a meal and told to eat quickly – the food was heavily poisoned with strychnine and all those who ate it died painful deaths. Their bodies were then burned with the wood they had chopped that morning. Two men, however, had refused to eat and made their escape. These two, along with two women who had followed the party and also witnessed the killings, returned to tell the story to their people. Passed down through the generations both as oral narrative and in the form of a joonba, Timms relates the story of the Bedford Downs massacre, in visual form, to record this tragic event both for the Gija people and wider audiences. The joonba was recently staged as the performance 'Fire Fire Burning Bright' at the Melbourne and Perth Festivals. Eric Kjellgren, Tradition today: Indigenous art in Australia , 'Timmy Timms', pg. 140, Sydney, 2004, 140, 141 (colour illus.). Russell Storer, Paddy Bedford , Sydney, 2006, 27 (colour illus.). Michael Wardell, Look , 'Thanks to a generous benefactor', pg. 14-15, Sydney, Oct 2003, 15 (colour illus. ).